Copyright : This item is reproduced courtesy of Uniting Church SA. It may be printed or saved for personal research or study. Use for any other purpose requires written permission from Uniting Church SA and the State Library of South Australia. To request approval, complete the Permission to publish form. The Australian Christian Commonwealth was formed in 1901, with its title reflecting the federation of the Australian colonies in that year, as well as the act of 'Methodist Union' in the previous year. Methodist Union saw the amalgamation of the Australian branches of the Wesleyan, Primitive Methodist and Bible Christian churches. In reality the newspaper differed very little in content or design from its earlier title, the Christian weekly and Methodist Journal. A string of Methodist ministers edited the newspaper, beginning with Joseph Berry. 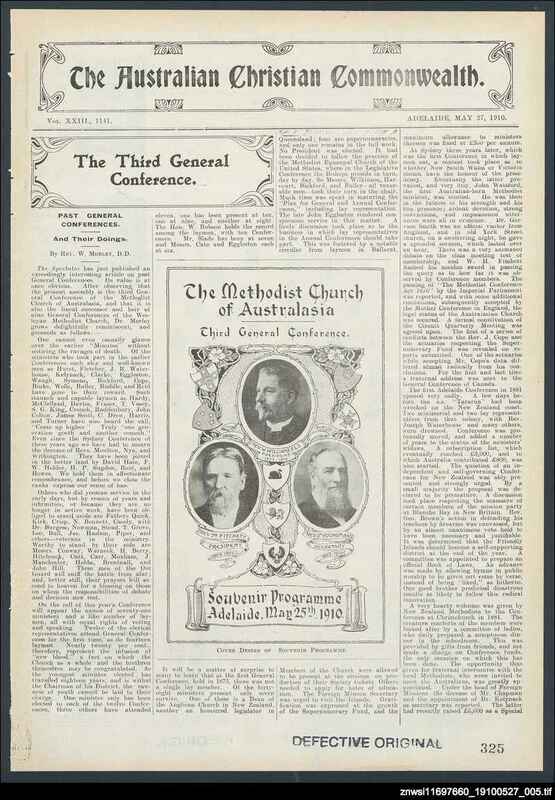 Sermons, snippets of general news, news of individual churches and 'circuits' (districts), as well as happenings at church schools and obituaries filled the pages of the Australian Christian commonwealth. There were regular columns aimed at children. These included Sunday School lessons, a children's page, and from 1902 under editor Charles Martin, a page for girls, and a page for young men. These were reasonably unique in newspapers in this state at that time. Advertisements were predominated by those advertising the two main church schools, Prince Alfred College and Way College (later Methodist Ladies' College) but include a proliferation of non-church related services and products. Interestingly advertisements for farm machinery featured largely until the 1920s - probably aimed at the many country readers - as well as advertisements for patent medicines, notably Dr William's Pink Pills, Dr Morse's Indian Root Pills, Ayer's Cherry Pectoral and Zam-Buk. Although specifically a religious newspaper, topics of wider interest also received coverage. Great interest was taken in the 1916 Conscription referendum. The editor of the Australian Christian Commonwealth and others had no compunction in filling the newspaper's pages with arguments in favour of Conscription. 'Never before has there been so much eagerness to bring the name of our Lord into the discussion of a national question' wrote the Rev. Peter Fleming. He concluded 'If it is right to be in this war, it is right to see it through. If it is right to send one man it is right to send every eligible and available man if it be necessary' (Australian Christian Commonwealth, 27 October 1916, p. 1). When the referendum failed, the elderly Rev. Octavius Lake wrote in indignation 'Contrary to all forecasts of sanity and patriotism regarding the referendum, the friends of the Kaiser have won' (3 November 1916, p. 1). He went on to list the various organisations and individuals who had worked against the vote including Roman Catholics, Labourites and the English 'Suffragists', such as Adela Pankhurst, and local MP Paddy Glynn. A far more open attitude, supporting an individual's conscience, was taken when the Second World War began in 1939. A similar format with much the same columns and articles was followed throughout the newspaper's history. There were noticeably less 'commercial' or outside agencies advertising in the Australian Christian Commonwealth between the wars. In this period there was also a sharp increase in articles dealing with the work of the church's local missionary agencies. This followed an increase in the provision of church-based social welfare support to those affected by the 1930s Depression.